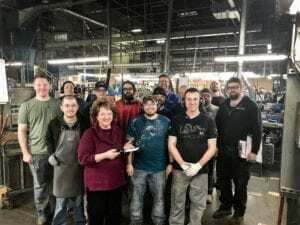 Buck Knives, leader in sports cutlery, is excited to announce it has reached a major milestone this month, surpassing the production of 1.5 million knives in its Post Falls, Idaho facility. This milestone was achieved due to the increased USA production needs and sales on their 119 Special and 110 Automatic models. To celebrate this milestone, Buck Knives will give away the signed and engraved 1.5 millionth knife on their Facebook page. This knife, signed by CJ Buck and Buck Knives owner. Lori Buck, wife of the late Chuck Buck, features a black phenolic handle, a 6″ clip blade, and includes a genuine leather sheath.